Discover local restaurants, bakeries, wineries, breweries and more at this festive event featuring unlimited sampling of food, wine, beer, tequila, and desserts! This year's attendees will also enjoy sampling margaritas, micheladas and cocktails! Enjoy music by live DJ, a fun photo booth and raffle prizes! Receive a free raffle ticket when you cast your votes for your favorites to help them win this year's Best Taste Award for Best Adult Beverage, Best Appetizer/Entree or Best Baked Goods! 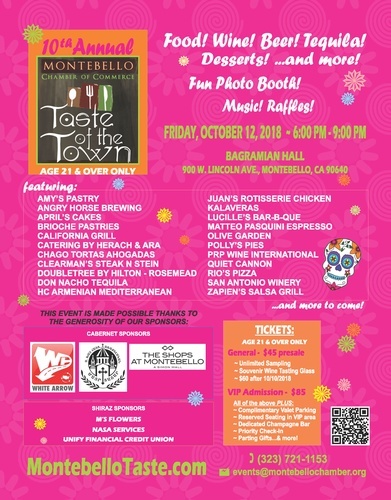 Sponsorship opportunities feature great benefits like: logo featured on all printed and digital prints at the photo booth, logo listed on cover of "Spotlight on Montebello which is mailed out to every house and business in Montebello (15,000+ distribution), and much much more! General Admission and VIP Admission tickets are now available for purchase in our offices or online. To purchase tickets online, click on the green "Register Now" button above. EMAIL US for any questions about sponsorship or event information.